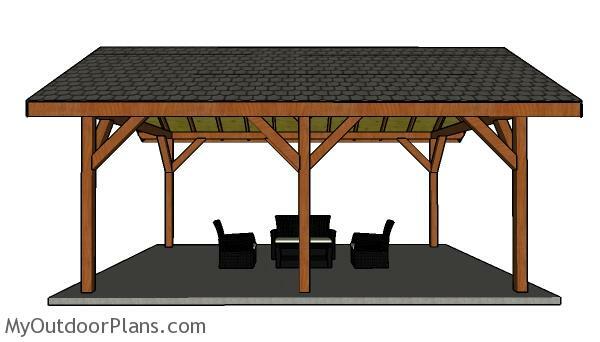 This step by step diy woodworking project is about a 16×24 outdoor pavilion roof plans. This is PART 2 of the large rectangular pavilion project, where I show you how to build the roof and how to attach the decorative trims. The roof has a 12:6 pitch, but you easily adjust it, if you need something else. Take a look over the rest of my woodworking plans, if you want to get more building inspiration. Use 2×6 lumber for the rafters. 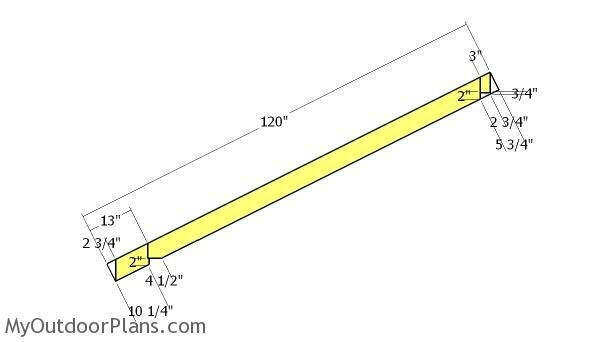 Make 26.6 degree cuts to both ends of the 2×6 rafters. Mark the cut lines to the rafters and then get the job done with a circular saw. Smooth the edges with sandpaper. Make the notches into the rafters, so you can fit them into place tightly. 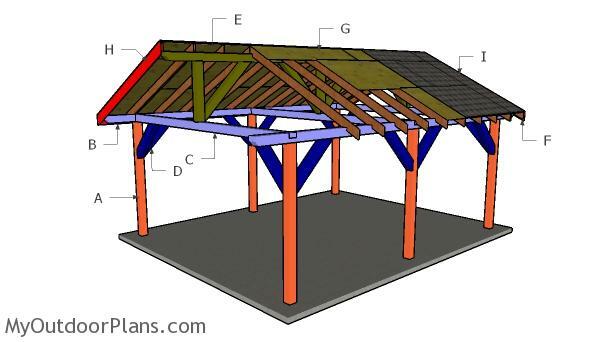 Fit the rafters to the top of the pavilion, using the information from the diagram. 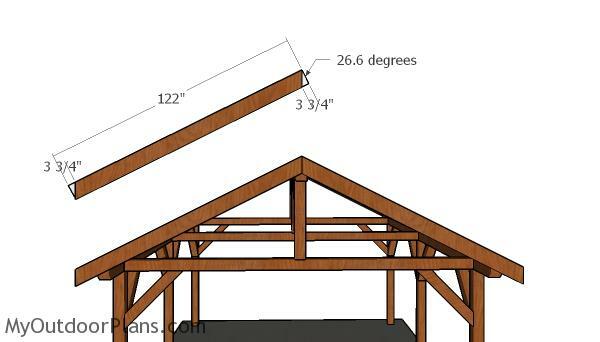 It is important to space the rafters properly (every 24″ on center), otherwise you won’t be able to attach the roofing sheets. 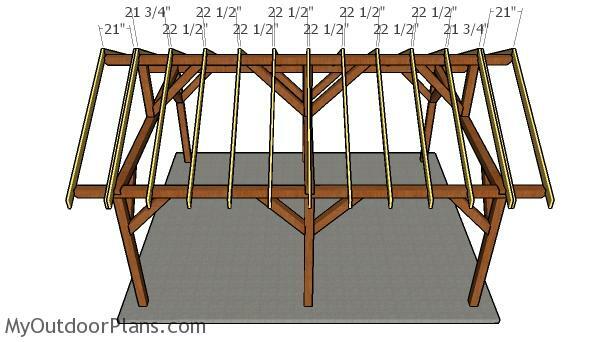 Use rafters ties to lock the beams into place. Fill the holes with wood putty and let them dry out for a few hours. Smooth the surface with 100-200 grit sandpaper and remove the residues with a damp cloth. Apply a few coats of stain or paint to enhance the look of the pavilion. Make sure you take a look over PART 1 of the project, where I show you how to build the frame of the pavilion. Top Tip: Apply a few coats of paint or stain to the components, to enhance the look of the project. 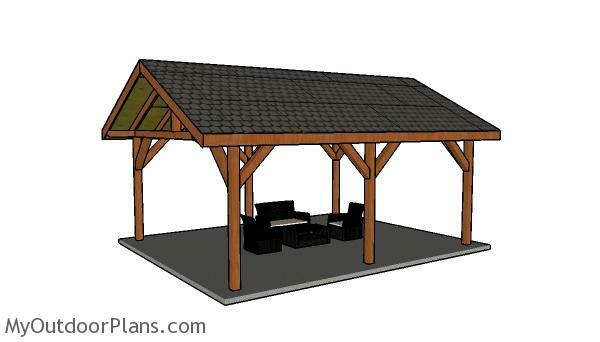 Make sure you take a look over the rest of my pergola/gazebo/pavilion plans HERE. See all my free woodworking plans (over 1000) HERE. 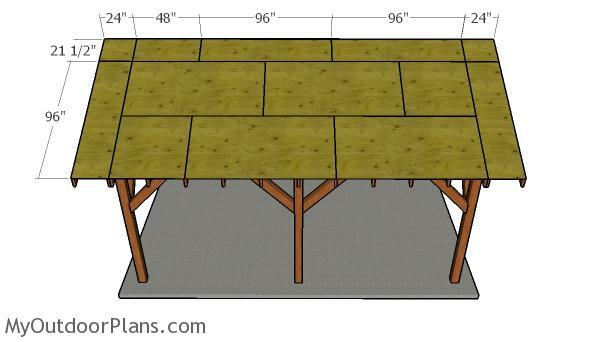 This woodworking project was about 16×24 outdoor pavilion plans free. If you want to see more outdoor plans, check out the rest of our step by step projects and follow the instructions to obtain a professional result. Feel free to SHARE my plans with your friends. 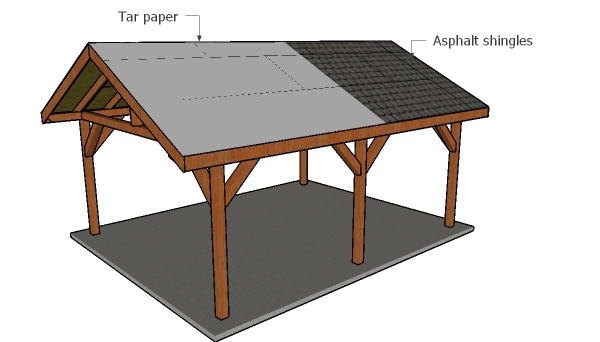 The page for the 16×24 pavilion roof gives instructions for a 15×20 pavilion roof. 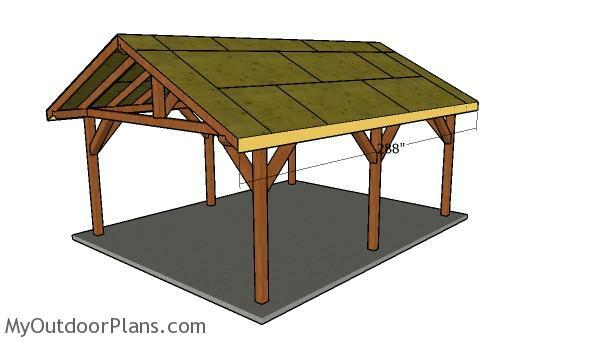 Could you please send the link to the correct plans for the 16×24 roof? Thanks! These are the plans for the roof of the 16×24 pavilion.